This entry was posted in Health and Fitness, Life, Lifestyle and tagged Clothing, Fashion, Girls in Yoga pants, Health, Life, Shopping, Yoga, Yoga Pants by The egg man. Bookmark the permalink. 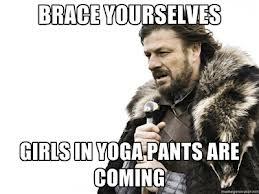 After losing 30 pounds, the women at work convinced me to buy more yoga pants because my other pants were hanging off me. I love how they feel and look on me. You can’t go wrong with one of those. They do look really comfortable. I think they gave the wearer a certain degree of self confidence too. Thanks for the comment and congrats!